Ningxia is a shrub, or cultivated as a large shrub by artificial pruning, 0.8-2 meters high. The diameter of stem diameter is 10-20 cm. The branches are fine and dense. Branchlets bow and the canopy is mostly round, with vertical ribs, grayish or gray-yellow, glabrous and slightly glossy, with leafless short thorns and leaves, flowers with long thorns. Leaves alternate or clustered, lanceolate or oblong-lanceolate, apex shortly acuminate or cuspidate, base cuneate, 2-3 cm long, 4-6 mm wide, 12 cm long when cultivated, 1.5-2 cm wide , slightly fleshy, veins are not obvious. On the long shoots, 1-2 individuals were born in leaf axils, 2-6 on a short shoot, clustered with leaves; pedicels 1-2 cm long, gradually thickened toward tip. Calyx campanulate, 4-5 mm long, usually 2-lobed, lobes with small tips or tip 2-3-toothed; corolla funnel-shaped, purple-purple-colored, tube length 8-10 mm, gradually expanding upward from lower part, Obviously longer than zygomatic lobes, lobes 5-6 mm long, ovate, apically rounded, base auriculate, margin margin ciliate, flowers open flat when spreading; stamen filaments slightly above base and corolla tube wall densely velvet; The style is like a stamen, with the corolla lobe extending slightly to extend its corolla. The berry is red or orange in the cultivation type. The skin is fleshy and juicy. The shape and size of the berry are varied due to long-term artificial cultivation or the age and habitat of the plant. The ellipsoidal shape is oblong, oblong, ovate, or nearly spherical. Has a short pointed or truncated, sometimes slightly concave, 8-20 mm long, 5-10 mm in diameter. Seeds often more than 20 grains, slightly shaped into a kidney, flat pressure, brown-yellow, about 2 mm long. The flower and fruit period is longer, generally from May to October, with the result of flowering. When the fruit is picked, a batch of mature fruit is picked. 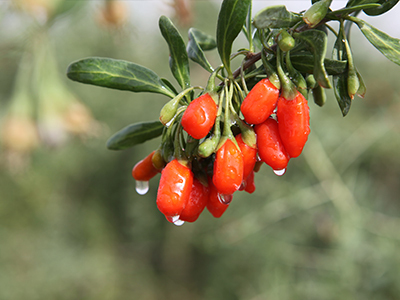 Looking for ideal Goji Berries Online Manufacturer & supplier ? We have a wide selection at great prices to help you get creative. All the Goji Berry Varieties are quality guaranteed. We are China Origin Factory of Goji Berries Superfood. If you have any question, please feel free to contact us.